Provide thermal protection to livestock with heating pads and blankets. Animal heating pads come with several strength settings, and offer consistent heating. Microplush pads are absorbent and antimicrobial, and offer covers that are machine washable and easily removable. Use our coat care products for added comfort and cleanliness. Apply anti-fly masks to horses for more protection. 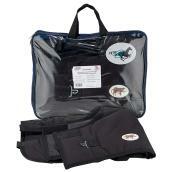 Calf blankets offer insulation through a breathable fabric. Check out our broad range of animal care products for maintaining the health and comfort of your livestock.